In Part I of this blog post, we experimented with time-saving methods using our two generous “guinea pigs,” Emily and Todd. They helped us try out what worked (and didn’t) when it comes to saving time, staying focused, and pushing personal productivity. In Part II, we concentrate on saving time when communicating. Streamline your communications for productivity. In the digital era, it’s easy to get wrapped up in messaging. We text. We use Slack. We WhatsApp, email, tweet, and post. With so many different channels for communicating, it’s easy to lose time. While these methods promise time savings, using several simultaneously can expand or prolong exchanges that could be handled in just a few minutes over the phone. For instance, our friend Emily, the self-employed writer and marketer, has established one streamlined system that works particularly well for her. She and a colleague exchange their articles for peer-to-peer review. They email the first version, making comments on a shared document, and then have a phone call over the final version. This system works for Emily because she has made her communications more efficient. First, she and her colleague work on a shared document. Second, they’ve identified a time to talk by phone that isn’t interrupted by others because it’s slightly outside of traditional business hours. Third, they’ve developed habits around these exchanges that keep them brief. How this can work for you: Speaking by phone or using an app such as Zoom or Skype while working on a shared document will shorten collaboration time and increase productivity. Also, using a trusted work partner as a sounding board can save time later because it prevents changes near a deadline when time is more critical. Email: How to handle the world’s largest time vacuum. Client concerns are real; but no matter who you are, failing to control email will sink you. In Emily’s case, it costs her whole weekends because it throws off everything else she schedules during her work week. Even for the most resistant among us, in the battle to control time, we have to recognize that finding a way to sort email is our best friend – and the starting point for any significant productivity plan. What’s important – Mark it with a star or other symbol. These are your active client- and project-related messages. What can be handled later – These are informational messages, requests, accounting matters, and personal messages, etc. Create a folder named something like “3PM” and move non-urgent emails there. What’s non-essential – These include sales pitches, conference notices, news items, and email newsletters, etc. Anything that isn’t critical to your role in the next 24-48 hours should bet pushed into a “free-time reading” folder. Every week or so, purge or unsubscribe to any unread messages. If you have to stay uber-alert for client needs, as Emily does, give yourself permission to scan your inbox twice an hour, but respond only to active clients during these brief checks. All other messages should wait for your scheduled email sessions. Tip: When a pressing client email interrupts your work, make your response super short. Don’t get into the topic, but instead acknowledge the client. For example, say “Got it! I’ll reply in more detail this afternoon,” or “Thanks. I’ll call you in 30 minutes.” Then, complete your current task-in-progress before getting into the weeds on another issue. Another good tip is to limit back-and-forth messaging. What could be one exchange turns into five or six emails, often because people (mistakenly) believe it’s polite to defer to others for decisions about simple matters. In that single message, you’ve covered what’s inevitably going to follow. By turning your initial response into a yes/no proposition, you’ve made it easier for the other person, and you can tentatively block time on your schedule. 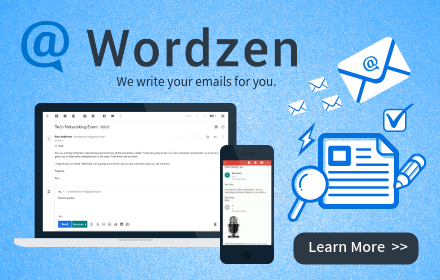 If you have access to Gmail, then an incredibly efficient way to work through your email, as well as keep your message quality high, is to use a service like Wordzen, which lets you take a big shortcut responding to emails. 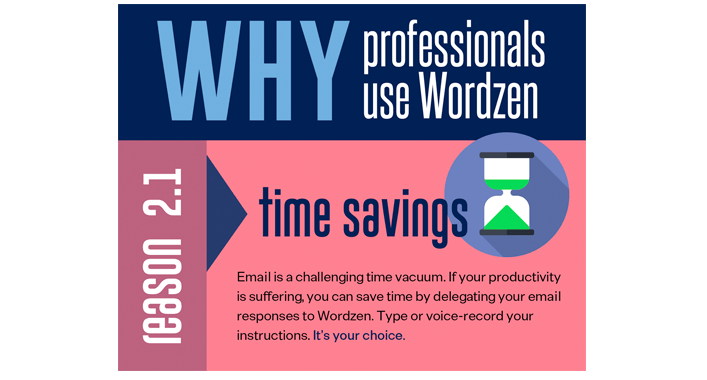 That’s because when you use Wordzen’s time (not yours), you’re multiplying your productivity. Tip: Wordzen’s editors lift hours off your plate each week. To engage them, all you do is click a button that lives in your Gmail account. Emily uses Wordzen this way: She includes the email thread to which she’s replying and then types out instructions, such as “Tell Cynthia I’ll send the mockup Thurs and the FB ads listed below will launch on the 4th. Ask her for a call on Fri. I’m open 11-3 Central.” Editors turn that into a professional message, using the context from the previous emails and referring to them for correct dates, spelling, and technical terms. It takes Emily about a minute to send Wordzen these instructions. Otherwise, it would take 10-15 minutes to organize the details and word everything “just right” for her client. Multiply that by six to ten such emails a day, and you can see her time savings. Bottom line: delegate the time-consuming portion of your emails. Saving time, staying focused, and increasing personal productivity come from habits, discipline, and helpful tools. Choosing those habits and tools takes thought because a best practice for one person might not work for someone else. Test and establish time-saving habits that work in your situation. However, no matter who you are, email can be a particularly challenging enemy of time efficiency, so push yourself to conquer that challenge. As you find time-saving, productive processes that work for you, you’ll finish more tasks on time, which will motivate you to continue your personal best practices every day. P.S. If you missed Part I of this blog post, click here.